I wish to thank the Sámi Centre for their support in helping me cover my travel and living expenses during my fieldwork. My research was conducted in North-Eastern Nepal, in the Khumbu region, about 30 km from Mount Everest. This area is a traditionally inhabited by Sherpas, with a Rai minority. For two and a half months I stayed in Namche Bazaar, the biggest village in the area. It is located at about 3500 m ASL and is geographically quite isolated: there are no roads, everything has to be carried on back or by yak caravans. While being remote it is simultaneously heavily influenced by trekkers/tourists from all over the world. The village has about 800 inhabitants, which increases to about 1600 during peak tourism season. Trekking tourism is the most important economic activity in the whole of Khumbu region. Landowners are mostly Sherpas, who run many kinds of businesses: lodges, hotels, internet cafes, restaurants, trekking shops and trekking companies. All this economic activity draws people from other areas of Nepal: Rais, Tamangs, Chaudharys and others. During the trekking season Namche is a meeting place of different castes, ethnicities and religions. I got my motivation for the fieldwork from a visit to that place as a tourist in December 2009. My interests lie in technology and the internet, and I was struck by the extent to which internet and other communication facilities have infiltrated the everyday life of people in Namche. Surely the internet connection was there initially to serve the tourists but local people started using it very quickly, too. The purpose of my study was to find out how the local people are using internet and how it has affected their lives. 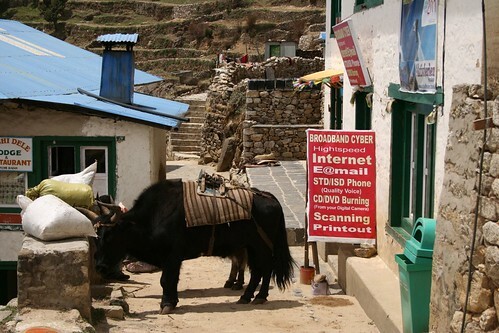 The arena for my research was a cybercafe in central Namche. The owner of this cybercafe was also providing internet connection to many other clients in the village and also in some neighbouring villages. I observed the people coming into the cybercafe to use internet and followed the employees on their everyday tasks of repairing internet connection for clients, serving customers and solving other problems. The second arena for my work was the local primary school, where I observed computer lessons for the 5th grade. School lessons in Namche Primary School were conducted in English, in order to give the children better opportunities for continuing their education (apparently most of the “better” schools in Nepal operate in English). I arrived at the peak trekking season in late April. As monsoon season got closer the number of trekkers decreased and from mid-May the town appeared half-deserted. I left in the beginning of July with the monsoon rains in full swing. My research methods were participant observation and interviews. As technical aids I used a video camera with sound recording equipment, photo camera and sometimes a separate audio recorder. I am starting the analysis of my fieldwork material now. A Master Thesis will be written and an anthropological film will be made from these materials. The funding from Sami Centre enabled me to spend the two and a half months of fieldwork period at Namche. Contrary to what one might think Namche is actually quite an expensive place to live. All that tourism has inflated the prices to an almost Western-European level (which is insane compared to the rest of rural Nepal). I am grateful to Sámi Centre for their help. This entry was posted in Master and tagged 2011, fieldwork, indigenous, Nepal, Sherpa, tourism, visual cultural studies. Bookmark the permalink.